The Forecast and Budget Builder for Excel is a streamlined solution for developing a 3 year business forecast and a 12 month budget. It requires minimal inputs and generates both optimistic to pessimistic forecasts for a business. A 12 month master budget is built from the forecasts with subsequent capacity to refine the budget as required. The methodology used applies relationships between current data and relative indicators for future performance to produce a verifiable budget quickly and easily. 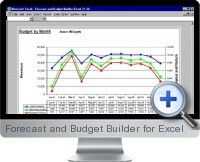 The Forecast and Budget Builder for Excel can be utilized for existing and proposed businesses, products or services. Outputs include a 3 year forecast with sensitivity analysis, and a budget by month in tabular and graphical form.